We had such a beautiful & very full long weekend. I hope you did too! The sun was pretty intense in all of the photos I snapped yesterday of my mostly finished Endless Summer QAYG quilt. This one is still waiting on binding, which is happening immediately, followed by a proper photo shoot as soon as it's possible! Even unfinished I couldn't resist bringing it along to the lake with us to take a few shots. 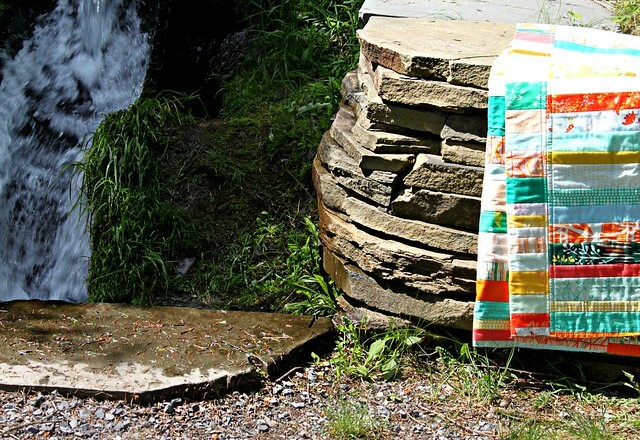 This little waterfall & stone spot is a favorite of mine, I love the way this quilt mirrors the stacked pattern of the rock wall! This morning it's a challenge to return to this sewing/quilting blog of mine since I haven't had a minute to sew in several days! I often think to myself how much easier it could be to maintain my blog with new, daily blog posts if I were brave enough to branch out from my usual fabric & quilt-y report to share more of the things we make and do together as a family, and even more if I shared all my recipes! I love to cook, I'm gluten free, and at times have been very low carb and no sugar, as well, although that's a tough one for me to stick with! Still, I can't help but wonder if sharing here, even just once a week, might help me stay the course and even better, might interest or help some of you, too? It's become such a habit for me to only photograph what's happenings in my sewing room each day to share here, as a result I pass over sharing more personal photography, all the simple joys, and so many of my favorite things! I’d love to read your thoughts today, as I work on something quilt-y to share tomorrow! What do you love most about blog reading? Go for it Maureen! It's your blog and it needs to make you happy or you won't enjoy being here. And we want you to be here! Thanks Kirsty! Sharing anything different the the usual feels a little like hitting that "Publish" button for the first time, but I think it will be fun to switch it up just once a week or even a little less, depending on how much I remember to photograph all the other little things I'd like to share here! I say do what makes you happy. I would enjoy reading about the other things you'd want to share with us! I like seeing new ideas and beautiful new fabrics. Also, love to connect with fellow "quilters" or crafters who are just living the love of sewing. It is very inspirational to me. I really enjoy the balance you have now between the amount of inspiration you share, the tutorials, and the giveaways! It's your blog. Use it as you like. I think you should blog about whatever you want. I enjoy what you post now, but I would also enjoy posts about healthy eating and it might even end up feeling like an "accountability partner" to you and it might be encouraging. Whatever makes you happy, go for it! This is really helpful! I would never stray away from being a sewing/quilting blog. Ever! I 'm just curious if my readers wouldn't mind the occasional post on our family trips or recipes that turned out really good, etc.. I just have other passions besides quilting, that I often want to share, and with the busy Summer vacation beginning in just a week, it might be the perfect time for me to share some of the other good stuff, too! I enjoy some recipes and some alternative crafty stuff in blogs. I do find posts just about what you've been up to with family annoying, but kid friendly crafts is interesting! Yes! :) I'm more wondering what you all as readers love most about reading blog? Daily inspiration, tutorials, giveaways? I like a mix myself! 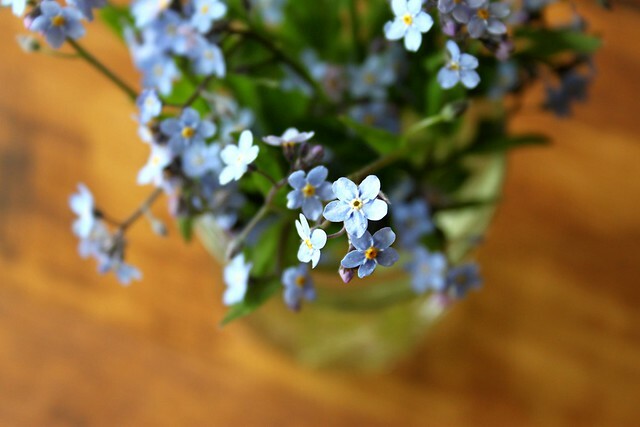 My favorite blog is Posie Gets Posy and it is so very different than my own blog. She's a very talented crafter/designer but I most enjoy her recipes and home decor inspiration! I've been writing my blog for 9 years and it has evolved from being purely a food blog to including my thoughts on books and crafts and parenting even. As a person grows, a blog grows and changes organically so my suggestion is: don't hold back. Thanks for writing this beautiful blog. I love reading about projects obviously, but I like to follow 'real' people, and as such, have them share about who they are outside of the studio and what else they do. I'd do what feeds you the most. I love to learn about the whole person behind the blog... but I know often some hesitate to share due to worries of safety or privacy... but I'd love to get to know you more Maureen! I have family members recently diagnosed with celiac and am having a hard time figuring out what to feed them when they come to visit... my FIL is especially having trouble because he was a cookie, square fanatic and is now feeling quite unsure about anything gluten free for his sweet tooth... any recipes you want to share would be more than welcome! Hi Maureen! I am gluten free too, I would love it if you shared your recipes! Just be yourself, don't worry about what people will think. I am astonished at how your blog has grown, I just started a blog myself and it is hard to get more viewers and followers! I think all the simple joys of our lives are what help us to connect to real people. I read a lot of quilt blogs..I connect with very few of the people who write them. I think sharing your other passions including personal family joys and pains helps the reader remember who you are and looks forward to keeping track of your blog. Cooking is my first passion, so I always enjoy seeing what other people cook. I would share what you want to share, and I'm sure many of your readers will enjoy reading your non-quilting posts too! Yours is the only blog I follow regularly. Your photography is fantastic and your quilts are amazing. Can it get any better? I don't know. But whatever avenue you choose, I'm sure it will be just as lovely and wonderful. Follow your heart. I love tutorials, all about fabric, make friends across the world that I can share with about any or everything! I love your blog Maureen, full of colors and ideas and it's great to know the person behind these words! I say to go for it, Maureen! I like to see what people are working on and some people, I enjoy the way they write, so I'll read the post whatever it's about. Ultimately, you're the boss! If anyone is not interested, they can go on to the next one, delete, whatever. Learning new things or re-learning how to do something better or in a different way. So many talented people in this world. I too, am low carb and gluten free so anything you would want to share from the kitchen is all right by me. Thanks! I do love all the quilty posts because they keep me inspired and motivated. I also enjoy cooking and other posts because it adds a personal connection. Thanks for your blog. Love seeing all the quilts and things you do in sewing ~ it's inspiration for me. I'd love to hear more about your life and what you do too! Love your blog! I love reading blogs, seeing what everyone is dealing with sewing, cooking, other crafts and some life in general. I'm not very techie, my computer froze and I can't afford to take it in for repairs so rely on my iPhone and can occasionally log onto to my brother's computer. Love seeing recipes and getting to do quilt alongs as budget currently is forcing me to use Stash only..(ok...mostly)! I love your sewing projects but it would be nice to knaw how you get organized , how you live real life and still manage to sew!! :) How you choose projects also is interesting. I think we readers like to read posts that makes us feel that we are not alone with our daily routine and struggles to get it all done!! You are one of my sewing heroes!! so it would be nice to get to know you a bit more through your blog:! and yes: a quilty sew along could be a great idea (but that is a lot of work!!) or some tutorials. I love your tutorials: I love this new quilt of yours and would love to know how wide and long each strip is. I like a bit of everything…quilting, food, photographs, musings…go for it! I have to say that I've really enjoyed getting to know you and others through your quilting blogs. What a wonderful community! And it is always special when you share a little bit more about your lives and what is going on outside your sewing room. Always like to see recipes too! It would be wonderful for you to share more about your life. Would love to see some recipes. I know it's hard to break from the quilting blogging. I have two blogs because of my diverse hobbies, but it is challenging to find enough to blog about. So go for it! Oh I'd love to see your recipes - all the blogs I read are either about sewing or cooking, so the combo would be great! I would enjoy hearing more about your recipes. More importantly I think you should do what feels right for you. The quilt in the waterfall pictures is soooo pretty! I quite like reading more family stuff too. Means we get to know you better. Personally I wouldn't be interested in recipes but it wouldn't stop me reading your blog. I donate a lot of baby quilts to NICU so I enjoy getting ideas for cute things to make. can i encourage you to read your "quote of the week" out loud .... as you sit at your computer and type about whatEVER your heart desires! Life is too short to be bound by what others "might" think ... as you are inspired - - DO!!!! Follow your heart, encourage ours in the process .. and thank you for allowing us to share in your journey! Blessings! Great advice and thank you!! My blog didn't begin as a sewing blog, I didn't even know how to sew until a few months into sharing here. I'm so grateful to have this space just as a way to look back and see how I've grown over these past four years, in addition to the countless other ways this blog has blessed me. I think having just one weekly post to share other/new things -- recipes, trips, non-sewing photography, and home decor ideas would be a great start! I would enjoy hearing about your gluten free recipes and your ups and downs with that. Like everyone else said, anything you would like to share would be great. If I am being honest, there are SO many downs!! So I've made the decision to not get to down and gloomy here, so I can keep this my happy place, because of my endless, extremely frustrating health issues. I prefer to stay positive here, as it really helps me stay focused on creating and enjoying each day! I agree completely with the above comment from Baby Steps and Stitches. I think it would be great for you to mix it up a bit with different posts about life and family. I know I will be right hear reading each post that you publish. Thanks for sharing with us! I love reading your blog, but I think it is also nice to get to know more about the person behind the blog and a great way to do so is to mix it up a little by adding some of your other interests. I would love reading new recipes and anything else you may add on here. The blog is yours to do with as you wish. I'd love to read more about what's going on beyond the beautiful quilts. Your recipes would be fun to see and maybe to try. Fabulous idea. I say go for it. Yes, please! I'd love to read more about recipes, family projects, etc! It doesn't have to always be about sewing! Perhaps I just needed to read that from a few of my readers today before I gave myself permission to share more of all the other good things happening! Thanks, Michelle! Maureen ~ As almost all before me have already said; go for it. It's your blog. I'm sure there are certain things you post now that some may skip over and not read while other things may be something even others may skip over. I think all of us would agree that having a happy Maureen posting what SHE wants to her blog as opposed to her feeling burnt out and closing the blog to help you feel better that it would be agreed that you should post what you want to. I personally love to cook although I don't follow the same diet as you are. That doesn't mean I might not see something you've posted that I can change a bit to make it for my family. We all have to eat, right? I think it would be wonderful to add something new once a week. I'd love to see some of your recipes or other things you are working on. You are so talented I can only imagine how inspiring you would be in other areas. I would find it quite enjoyable to see a bit more of your daily life, and the recipes and eating "styles" you use/have used would be quite interesting to me as I have multiple food sensitivities and have tried various eating regimes! I enjoy your blog a TON - I don't think you could go wrong whatever you decide!!! Of course your life, combined with your sewing, would be very interesting. Don't shortchange the sewing, though! I like to read sewing blogs for the inspiration I get to keep working on my own things (mostly upscale outfits to fit the American Girl family of dolls, which I make and sell.) Inspiration can come in many different ways. I, also, must be gluten-free, so finding out what your are cooking and learning in that regard would be great. Ooh, making American Girl dresses is something my daughter and I would love to try this Summer! My blog will always be a sewing/quilting blog, but as I mentioned below, I feel that I really boxed myself into that category to a point where it's not so natural for me to segue into all the other things being made and experienced that would also be nice to share occasionally! Hi Janet! Thanks for chiming in! I absolutely plan to continue this as a quilting/sewing blog first and foremost, but I have really boxed myself into that category to a point that it's challenging for me to segue into anything other than that topic. My greatest passion in life is "making" and not just sewing. Cooking, making drinks, being crafty, and decorating are all things I love just as much! I like quilty goodness, but I also just enjoy your voice as a blogger. Do what makes you happy! I've got a ton of food allergies, so I'm always happy to hear how someone else negotiates issues. Please share anything, we believe my son is allergic to flour, would love some gluten free recipes, we are having a hard time coming up with things he is willing to eat. It's nice to see more than one aspect of your life. We love to see the beautiful things you make. Adding in pieces of your family life and recipes you love would be awesome too. I think it's nice when bloggers share themselves! I have 2 daughters who are gluten free. I'd love to see recipes and anything else you'd like to share! I love your blog as-is but I love seeing posts about your family as well. Would really enjoy posts with gluten/carb free recipes as I have been "dabbling" with the Paleo Diet and have had pretty good results (but still struggling a bit with the sugar thing!). I would also love to see more of your town...your photos of your quilt locations are beautiful! Have a great time sewing today! Write about whatever you want. Some people will like it. I personally don't LOVE hearing about non-quilty stuff on my quilting blogs, but I have no problem at all doing a quick skim and moving on to the next one if the topic of the day doesn't interest me. I happen to love looking at pics of people's dogs and houses. Yes, that sounds like a great idea! I personally trying to loose some weight. So your recipes would be very helpful. Of course love seeing your family updates. I would still stop and read your posts. I like reading your blog about all your quilty stuff but would love to read about your cooking,family,recipes. I love seeing new fabrics, the quilts you make and just hearing about your day. It's like a phone call from a friend. I come for quilty sewy stuff, so don't ever change that, ooh and crowns, too.but don't feel like you have to post every day. I don't want you to post because you feel like you have too. I'm fine with 3x a week or whatever works for you. I have other blogs to read, and I prefer quality over quantity. Makes me appreciate you more if I don't see you every single day ;) keep up the good work! I'm really interested in all aspects of people's lives, as much as they are willing &/or able to share - I understand that all elements of a crafty, creative person's life contribute to the finished projects. So feel free to document & share whatever feels right for YOU,! Well done & keep up the brilliant work. First I'd like to say this is your blog. Put what you want in here. Some things are relevant to everyone. I'd hate to have to stick to just quilting, when the day is beautiful outside or your kids just did something really wonderful--sometimes we just want to share! I love the personality that shines through. Everyone is different, and the little things in the blog that are totally 'you' are the bits that keep me coming back. So throw in the cooking, and the redecorating if you want to, and the times you burnt on to the pan or spilt the paint pot... it is all life! I prefer blogs that give me some insight into their full life and not just focus on quilting. I would be especially interested in your recipes. Your love of fabric and sewing is already an inspiration. I can only imagine that your creativity in other areas would be just as inspiring! Posie Gets Cozy is one of my favourites too - love the photo journal aspect of her posts. Sharing more of your life and who you are is helpful in knowing you better as a person without missing out on the quilt/fabric goodness which you share so beautifully. I love what you write now but if you want to add more go for it. Maybe let us know that's where your heading and put a sub heading of life post or something like that so those who aren't really interested can easily skip that post. I often enjoy hearing what else is going on in bloggers lives. Unfortunately almost all of us have to do other things in our days rather than sew. I would find it difficult to write about the same topic all the time--too many interests, sewing & quilting among them. I love to cook and am gluten free also. Since going gluten free a few years ago for digestive issues, I find following a low carb eating plan much easier. Would love to have you include recipes, gluten free, family, other interests, etc. mixed in with your stitching topics. I would like to add another yes to sharing other stories from your week, like meal planning and recipes, creating with kids, and general life ups and downs. I'm both gluten and dairy free and sometimes it's REALLY tough. If it helps you to share those things then do it! Who cares what we think!